Visit our fully furnished Luxury Condo with free WiFi, which sleeps six comfortably, and is located in beautiful Pigeon Forge, Tennessee. Enjoy the indoor and outdoor swimming pools in addition to the large hot tub. Need room for more family and friends? Two doors down is our other condo at www.vrbo.com/1094773. Picturesque views of the Smoky Mountains surround you as you relax on our wraparound corner balcony. With so many activities to do in the Smokies, you'll want to come back again and again. We know this will be the perfect place to stay for your next vacation. Read our reviews! Located only a 1/2 mile off the main parkway in Pigeon Forge, our condo gives you easy access to everything the area has to offer. We are less than 5 miles from Dollywood. Our new condo includes luxury furnishings with granite countertops, free WiFi, cable TV, flat screen TVs and DVD players for your enjoyment after you are done exploring the Smoky Mountains at the end of a fun filled day. Master bath has large 7 foot walk in shower easily accessible for those who are handicapped. Visitors also have full access to an indoor pool complex, hot tub, fitness center, and game room. We also have a meeting room downstairs available for an extra fee to the resort. Married for 28 years, 3 children, 2 girls and 1 boy. Beautiful mountain views with so much to do in the area. From hiking and picnicking with the family, to go-karts, indoor skydiving and all the shows not to mention the restaurants - just have to keep coming back! Starting and ending the day on the wraparound balcony. Fresh air, mountain views are so refreshing compared to the suburban living outside Chicago which we are used to instead. Large walk in shower and whirlpool tub in the master bathroom. Balcony faces to the west with beautiful sunset over the mountains. Washer present in condo for free use. Dryer present in condo for free use. Max 2 cars per guest please. Bath towels provided. Please bring your own pool towels from home. Ellipticals and Exercise Bike on 1st floor of the condo building. Small game room on the 1st floor of the condo building. Wraparound balcony with great views. Indoor Salt water chlorinated pool, seasonal outdoor chlorinated pool. Needed a few things fixed and replaced but overall good! We strive to provide a comfortable and clean vacation property for our guests. I was made aware of some issues with flushing one of the toilets which I had fixed upon the guest leaving but that was all I knew about. A new refrigerator was just installed on March 8th when I was at our condo making sure everything was in good working order for this year. We appreciate any feedback to make sure all of our guests have 5 star experiences at both of our vacation condos. We enjoyed our stay very much. The condo was in a great location and close to all of the activities we planned. It was clean and well kept, and I appreciated the little extras like nightlights throughout the condo and labels on the switches. The beds were comfortable and rooms a good size. Though we didn’t cook, the kitchen appeared to be stocked well. We liked that it was a corner unit, and you did have a pretty view of the mountains on the side patio. Overall we were happy with the room and would stay again. If you ever want a turn-key Pigeon Forge experience, this condo is it. the Management (John) has this down to a science and it's well documented. The directions are excellent (and it's a tiny road past the subway on Wears Way you could easily miss), access to the cabin and the amenities is super easy, and everything you could ever need is already in the condo right down to the utensils, coasters, dishwasher pods, etc. The condo has a very rustic cabin feel, so for you outdoor enthusiasts, you'll feel right at home. The location is awesome. You've got a great view of the smoky mountains right on the deck, you're just far enough away to not hear/deal with the Pigeon Forge throng, but you're a hat drop distance away from all the attractions. The alpine coaster at the end of the road is also a great way to finish out any day (it runs till 10pm and has lights). I've been to Pigeon Forge now several times, and this by far was my best experience with a rental. Book without fear. Thank you for the wonderful review! 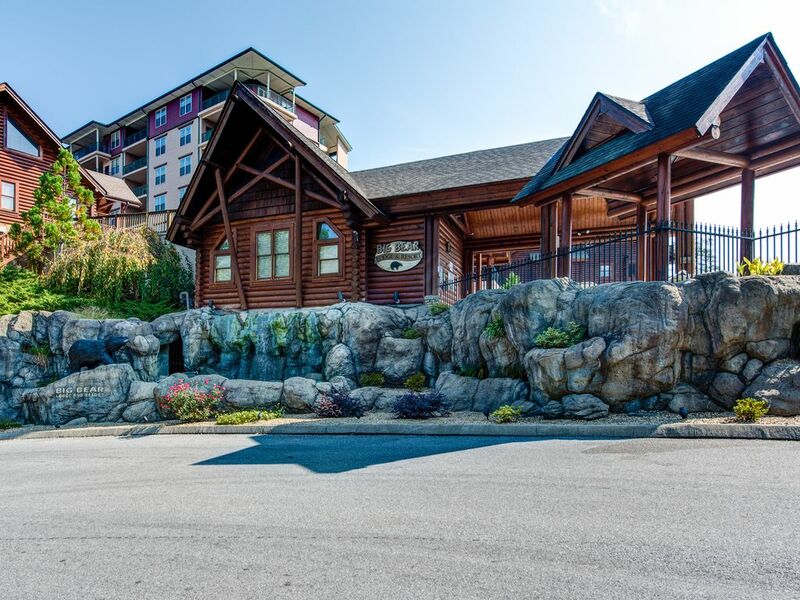 We strive to provide you with luxurious, comfortable and affordable accommodations with professional and personalized customer service so you can spend your time making those Smoky Mountain memories you deserve! Very nice condo. Was everything as described. Enjoyed it tremendously! Great location, clean, nice size for our family. We would love to return! We loved our time away in this wonderful co do! Perfect location! Very clean and beautifully decorated for Christmas. We really loved staying in this condo. CANCELLATIONS – A forty five (45) day notice is required for cancellation. Cancellations that are made more than forty-five (45) days prior to the arrival date will incur no penalty. If canceled between 14 and 45 days, you will be given a full refund less a $50 processing fee. If canceled inside of 14 days the reservation is non refundable and you will be allowed to reschedule your reservation. Cancellations made less than 48 hours prior to arrival date are non refundable and not subject to rescheduling. Early departure or late arrival does not warrant any refund of rent or deposit.